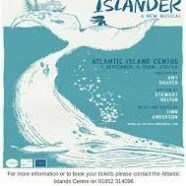 A magically minimalist production, Islander challenges the possibilities of imagination in story, technology, and staging. Through enchanting a cappella vocals and looping technology, the two sole performers, Bethany Tennick and Kirsty Findlay, weave a vivid world and populate the island. It feels like home to the audience, who are seated in the round. On a tiny island in present day, we meet the youngest resident, 15-year old Eilidh (Tennick), who has never left home. Her life seems unusual until it is paralleled with Arran’s (Findlay), who has spent her life at sea. Each girl finds the other to be more fascinating and foreign than herself. Their excitement to discover each other illuminates the magic that unfolds when we welcome new perspectives and are open to learning from those who have lived differently. The girls navigate how humans can live in harmony with nature, and the challenges of migration both for the islanders and for the suffering population of whales that inhabit the surrounding seas. Composer Finn Anderson’s score brilliantly balances the mystical, foggy nature of island life with the frustration of fuzzy cellphone calls, and the strain of remoteness. Intimate and spacious at the same time, this musical explores loneliness and community, and how magic can be found simply by paying attention.